About | Mathers Environmental Science Services, LLC. Mathers Environmental Science Services (MESS) became an LLC in 2010. Prior to owning MESS, Dr. Mathers was a professor and state extension specialist for nursery and landscape at The Ohio State University for almost 15 years. 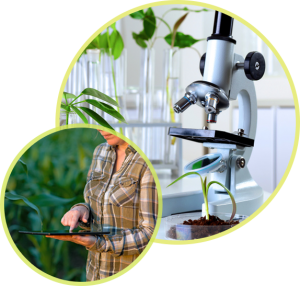 Dr. Mathers has a PhD from Michigan State University in Horticulture, a Master of Science in Horticulture from University of Saskatchewan and a Bachelor of Science in Plant Science/Pomology from Cornell University. Dr. Mathers also has Associate Degrees in Forestry and Agriculture from Sir Sandford Fleming College and University of Guelph, respectively. Dr. Mathers is also a certified Commercial Pesticide Applicator. Dr. Mathers along with her husband Mr. James Beaver started MESS, LLC with a company mission of reducing herbicide usage and weed control cost via bio-rationale and organic approaches; improve weed control application technologies and timing of applications, to increase efficiency; investigate long term impacts of weed control and other cultural practices on carbon sequestration, runoff control and pollution mitigation in urban environments; and, investigate fertilizer practices in nursery fields, landscapes and nursery containers to reduce nutrient waste and optimize applications. Mr. Beaver has a Bachelor of Science in Horticulture from University of Minnesota and a Master of Science in Plant Breeding and Genetics from Michigan State University. Mr. Beaver has responsibilities as Editor, Head of Accounts and Research Associate. Their daughter Emma Beaver also works seasonally and part-time for MESS as Web Master and a Research Assistant. Emma is currently completing a Bachelor of Arts at The Ohio State University, Columbus, OH. Dr. Mathers is the Principle Investigator for all research trials, expert witness cases and consulting activities.